The aim of the precrec package is to provide an integrated platform that enables robust performance evaluations of binary classifiers. Specifically, precrec offers accurate calculations of ROC (Receiver Operator Characteristics) and precision-recall curves. All the main calculations of precrec are implemented with C++/Rcpp. precrec provides accurate precision-recall curves. precrec also calculates AUC scores with high accuracy. precrec calculates curves in a matter of seconds even for a fairly large dataset. It is much faster than most other tools that calculate ROC and precision-recall curves. 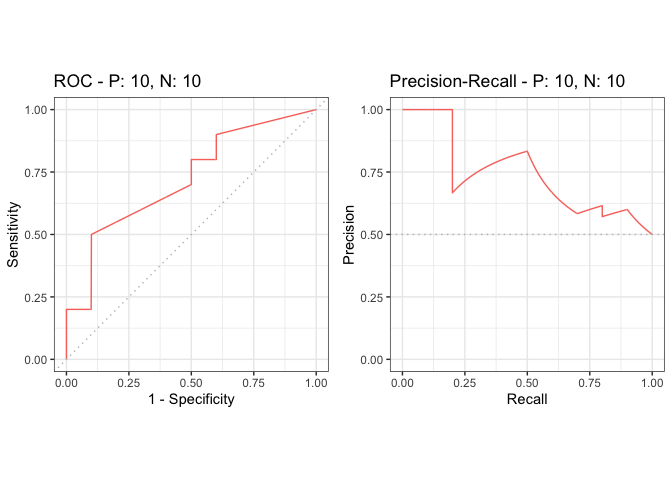 In addition to precision-recall and ROC curves, precrec offers basic evaluation measures. precrec calculates confidence intervals when multiple test sets are given. It automatically shows confidence bands about the averaged curve in the corresponding plot. precrec calculates partial AUCs for specified x and y ranges. It can also draw partial ROC and precision-recall curves for the specified ranges. precrec provides several useful functions that lack in most other evaluation tools. Install the release version of precrec from CRAN with install.packages("precrec"). Make sure you have a working development environment. Windows: Install Rtools (available on the CRAN website). Install devtools from CRAN with install.packages("devtools"). Install precrec from the GitHub repository with devtools::install_github("takayasaito/precrec"). The precrec package provides the following six functions. Moreover, the precrec package provides eight S3 generics for the S3 object created by the evalmod function. N.B. The R language specifies S3 objects and S3 generic functions as part of the most basic object-oriented system in R.
Introduction to precrec - a package vignette that contains the descriptions of the functions with several useful examples. View the vignette with vignette("introduction", package = "precrec") in R. The HTML version is also available on the GitHub Pages. Help pages - all the functions including the S3 generics except for print have their own help pages with plenty of examples. View the main help page with help(package = "precrec") in R. The HTML version is also available on the GitHub Pages. Following two examples show the basic usage of precrec functions. The evalmod function calculates ROC and Precision-Recall curves and returns an S3 object. The autoplot function outputs ROC and Precision-Recall curves by using the ggplot2 package. Bioinformatics 2017; 33 (1): 145-147. Classifier evaluation with imbalanced datasets - our web site that contains several pages with useful tips for performance evaluation on binary classifiers. The Precision-Recall Plot Is More Informative than the ROC Plot When Evaluating Binary Classifiers on Imbalanced Datasets - our paper that summarized potential pitfalls of ROC plots with imbalanced datasets and advantages of using precision-recall plots instead. Advanced R and R packages - web sites of two Hadley Wickham’s books that we used as references to decide the basic structure and the coding style of precrec. Developed by Takaya Saito, Marc Rehmsmeier.